1.1 The copyright of all music recordings offered by Hartwigmedia are protected by the copyright law of the Federal Republic of Germany and international agreements. The client of Hartwigmedia obtains a worldwide, perpetual, non-sublicenseable, non-exclusive usage right of the music as defined below. The client does not become the owner of the music but obtains a usage right. 1.2 Music Productions offered by Hartwigmedia are royalty free and not registered at any PRO (performing rights organisation) worldwide and are free of rights and claims of any third persons. These information are provided by the particular composer and owner of the music rights. Therefore the client has not to pay any additional fees to a PRO. Also performing rights organisations are not authorized to collect any royalties. As Hartwigmedia relies on the information provided by the composers, Hartwigmedia can not been made liable to any losses or costs occured by a false information regarding the registration of the music of a composer at a PRO. Hartwigmedia creates for every commercial license a licensedocument for the licensee, free of charge. 1.3 The licensee is allowed to use the licensed audioproductions on a per project base for one customer of the licensee and for one project of the licensee´s customer. 2.1 By paying the full license fee, Hartwigmedia grants the licensee a worldwide, perpetual, non-exclusive, non-sublicenseable usage right of the music. 2.2 The audio files may be used within the following specified project frameworks that has to be specified during the purchase procedure by the client. Hartwigmedia offers a free of charge version of the audioproductions via direct download. These can be used free of charge as Testversion for non-commercial and private projects as specified later. As non-commercial, Hartwigmedia declares all projects that have not the intention to earn money or are generating profit of any kind. 2.3. The concession of rights of usage also includes the right to convert the music technically into the required data and audio format. Also it is allowed to shorten, edit and alter the music. A modification of the music piece has to be done in a way that not changes the character of the music track. 2.5 Registration at the website www.Hartwigmedia.com is free of charge. Registration is required to download the music files. 3.3 The client is not permitted to use the audio material in a way that incorporates material which the client does not own or has authority from a third party owner to use. In addition it is prohibited to use the provided audio material as theme song for any motion picture, television, radio, web or multimedia program or show. It is not permitted to use the audioproductions in so called “Website Templates” which are made for resale without the agreement of Hartwigmedia. 3.4 Usage that contravenes the laws of the Federal Republic of Germany, the European Union or is harmful to the public order or public morality is not allowed. 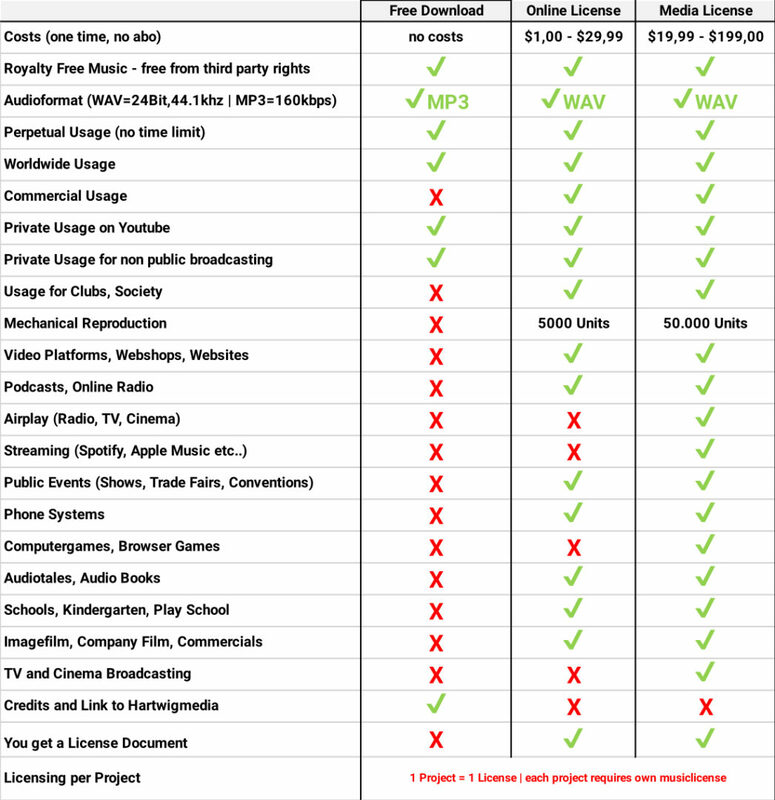 3.5 External Music Studios and Audio Producers are not allowed to use any of the audioproductions from Hartwigmedia neither as non-commercial nor as commercial version. Publications of the audioproductions or parts of them under another Name or Label are strictly forbidden. 3.6 Hartwigmedia Audio Productions can not be registered at any PRO Performing Rights Organisation worldwide (e.g. GEMA, SUISA, BMI, ASCAP etc…). This is also valid for own created Voiceover Productions regarding the music parts (e.g. Audiotales, Meditations etc..). Any costs or losses arise from registrering Hartwigmedia Audio Productions at a PRO will be assumed by the licensee that registred the audio productions. All incidental damages arise from the above stated restrictions have to be fully acquit by the person who violated them. 4.1 The laws of the Federal Republic of Germany applies, with the exclusion of UN sales law, as well as of the conflict of laws standards of international private law. The place of performance is to the extent that it is legally permissible Radolfzell am Bodensee, Germany. The jurisdiction for all disputes is Radolfzell am Bodensee. 4.2 If all or part of any term of this agreement is wholly or partially unenforceable, the parties or a court of competent jurisdiction, shall put in place of such whole or part provisions, that nearly reflects the terms of an unenforceable whole or part provision. 4.3 Hartwigmedia shall not be liable for any damages, costs or losses arising as a result from using the audio content by the customer or the context in which the audio content is used by the customer. 4.4 You acknowledge that you have read this agreement, understand it and had an opportunity to seek independent legal advice prior to agreeing to it. You agree to be bound by this agreement. Hartwigmedia reserves the right in case of a commercial licensing of the audioproducts, to name the customer and/or the projectname of the customer (customer logo and/or link to customers website) on the Website (www.Hartwigmedia.com). There will be no transmission of the customer data to a third party of any kind. 4.5 All prices in the shop are before tax. The legal required tax of your country for music productions comes on top of the listprice and stated in detail in the cart and during the checkout. 4.7 All music productions will be provided as digital downloads. The customer has to take care that the email address he provides during the purchase process is valid, as the download data will be submitted to this email address.